What does a truly inspired person look and sound like? And what can Inspiration Power do for you? If you’re not Inspiration Empowered yet, let me get you there! Finding the answers to those questions was the beginning of my transformation into becoming my truest and most empowered self. This path may help you too! This wise little book offers 16 key tools that expand your vision of what it means to be a truly Inspirational human being. On each page is the knowledge of how to play big, lead well, learn quickly, and live fully. 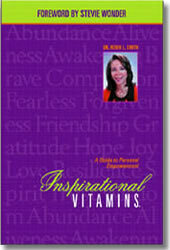 Take a taste of Inspirational Vitamin Awakening – there is something special just for you! After tasting this small dose of Vitamin Awakening, I trust that you will want to experience more from Inspirational Vitamins, A Guide to Personal Empowerment. It is rich in meaning and practical in application…there is helpful information for everyone. Was there a time you felt awakened? Did you see, think, or feel something new? What was it? Who helped you? Have you ever helped someone awaken to new information, ideas, and new realizations? Who was it? Would you do it the same way again? Do you know anyone who refuses to awaken? Who is it? What is it like for you being in a relationship with them? If there were someone you could trust with your life that could safely and gently awaken a part of you that is still sleeping, what part would it be? What do you need to be reassured of before you awaken? Given these questions, can you say what you’ve learned from taking a tiny dose of Inspirational Vitamin Awakening? How has someone inspired you, or how have you inspired someone? Be grateful and seek all of the simple ways that Inspiration is waiting to befriend you! May the force of Inspiration Power be with you today and always!